To force a Tulip means to pot the Tulip bulb, replicate winter conditions and bring into bloom earlier than its normal spring bloom time. One can force a Tulip to bloom earlier, but one cannot force a Tulip to bloom later. The first consideration is to select Tulip varieties that are good for forcing. Not all Tulips force well. The best Tulips for forcing are found within the Species Tulips, Double Early Tulips, Single Early Tulips and Triumph Tulips. 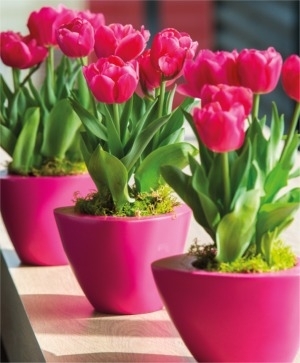 We recommend selecting just one variety per pot so that it is a fully blooming pot. We do not recommend forcing Tulip Mixtures. Schedule your flower bulb order delivery for early to mid-October. 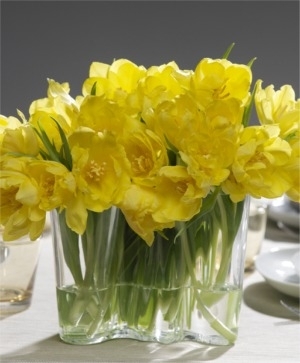 Once you receive your order, open and examine your flower bulbs to make sure that they are firm and healthy. If any of your bulbs have a blue-gray transportation mold, remove it with a paper towel or put the bulbs in a single layer in the sun. If any bulbs are soft, please discard them and do not prechill them with your other bulbs. 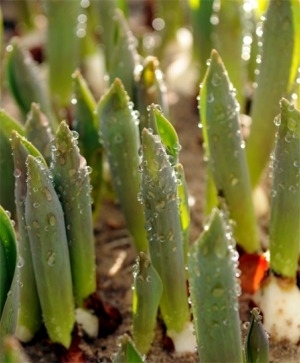 Forced flower bulbs must be potted in soil prior to prechilling. (Hyacinths bulbs may be potted in soil or suspended in water in classic hyacinth glasses prior to the prechilling process.) Select the proper sized pots with good drainage. Use a good, sterile potting soil. You want a potting medium that will support the growing flower bulb and that will hold enough moisture for proper root growth. Place a broken pot shard in the drainage hole at the bottom of the pot to prevent soil seepage when the pot is watered. How many bulbs per pot? As many bulbs as will fit shoulder to shoulder in the pot! We like nice, full pots of flowers! Some people prefer to snap off any little baby bulbs from the sides of the mother bulbs (if there are any) to ensure the highest flower count per pot. Fill each pot half way up the sides with potting soil. Place the flower bulbs (root side down) in the pot. Fill the rest of the pot up with the potting soil to 1" underneath the top of the pot. Tamp down the soil lightly and add a bit more soil if necessary so that the soil level is 1" below the top of the flower pot. This is so that the water and soil won't slosh over the side when you water. Tulip bulbs are nature's perfect little suitcases filled with everything that each bulb needs to bloom perfectly. We recommend against adding any fertilizer whatsoever to the pot. Adding fertilizer can result in excessive foliage production and if added to the soil underneath the bulbs, it could also cause root burn. Insert plant labels in each pot to identify the variety being forced as well as the date that you are putting it in to cool. Keep a record of which varieties force well for you for future years! Place the flower pots in a dark refrigerator or cooling unit that maintains a consistent temperature between 35°F and 45°F. Never put them in the freezer! Do not prechill bulbs with apples or pears which release ethylene gas as they ripen. You may also put the flower pots into an unheated cellar or garage as long as it stays at a consistent temperature between 35°F and 45°F. Install a minimum-maximum thermometer to monitor the temperature. 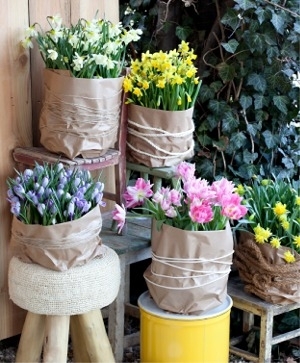 Cover the pots with newspaper to keep them in the dark. Flower bulbs must have a consistent temperature range during the prechilling period in order to develop a mature root system. In fact, they hate freezing and thawing cycles and any type of temperature spiking. 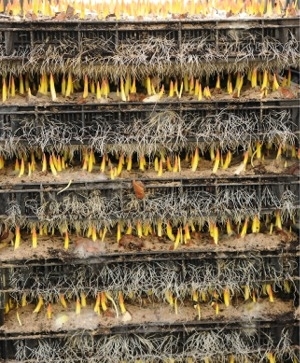 Temperature spiking reduces the bulb’s viability and results in immature root development. You may also sink the pots into an outdoor cold frame or into a trench and cover them with a 6" to 8" layer of salt hay or sand to over winter them. Make sure that the cold frame or trench is below the freeze line: flower bulbs do not set down roots in temperatures below 32°F. Check the flower pots once every week or so to see if they need to be watered. If the soil is bone dry to the touch, water moderately. Cool the pots of Tulips for 12 to 14 weeks. We recommend keeping the pot prechilled for the maximum time period so that the bulbs develop good root systems that anchor the bulb into the soil. Small shoots will also sprout through the soil: To avoid stunting sprout growth, DO NOT STACK THE POTS ON TOP OF ONE ANOTHER. Due to the lack of sunlight, the early top growth will be white to pale green-yellow in color. At the end of the cooling period, bring the flower pots out into filtered sunlight in a relatively cool spot to permit the new sprouts to acclimate themselves to the sun and warmer temperatures. Gradually move the pots into progressively stronger yet still somewhat filtered sunlight for three to five weeks. Water as necessary. Once the bud emerges, move the pot into direct sunlight in an area about 50°F to 65°F. Once the flower buds color up, the pots may be placed virtually anywhere for maximum viewing and enjoyment. Just remember that the cooler the ambient temperature, the longer the flowers will thrive. Once Tulip bulbs are forced, they are pretty much spent and should be discarded. It's wonderful to have pots of Tulips blooming in the winter! It's also nice to have extra pots that you can use as a private cutting garden so you can have vases of Tulips over the winter too. Your Tulips will be larger than those available as cut flowers since you've planted size 12 cm/up bulbs from us. If you loved forcing Tulips and want to expand your indoor garden this year, other types of flower bulbs that are good for forcing include Narcissi, Crocus, Scilla, Rock Garden Iris, Hyacinths, Muscari, Chionodoxa, Anemone blanda, Fritillaria meleagris, Fritillaria meleagris alba, Oxalis adenophylla, Puschkinia and Lilies.